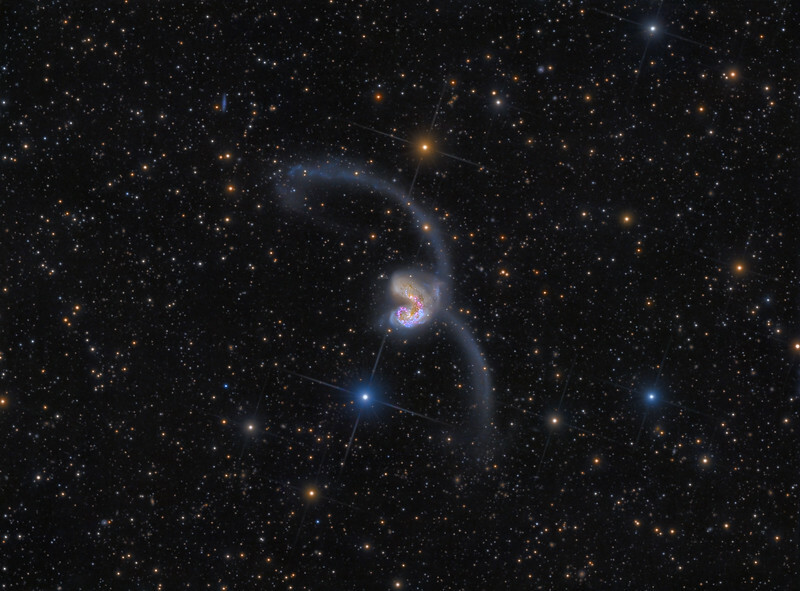 Following on from my previous Extreme Deep Field project of Centaurus A, I turned my attention to a spectacular pair of colliding galaxies known as The Antennae, located around 45 million light years away in the Southern constellation of Corvus. This interacting galaxy pair was discovered in 1785 by William Herschel. To obtain a unique deep view of the faint tidal streams and numerous distant background galaxies I gathered 75 hours on this target during 38 nights from January to June 2014. This project was not blessed with the same long run of clear nights as I had enjoyed in 2013, so this amount of data took 6 months to accumulate, two months longer than the 120 hours I collected on Centaurus A the year before. However, the telescope used was my new larger 12.5" f/4 Serrurier Truss Newtonian telescope, which I built in late 2013. This telecope gathers approximately 156% the amount of light over the old 10" f/5. The total integrated signal is therefore theoretically approaching that of the Centaurus A image. The faintest stars and background galaxies visible in the raw image data have magnitudes between 24 and 25, confirmed via photometric calibration of the integrated FITS luminance file against the USNO catalogues. The iconic features of these two interacting galaxies are the two long tidal streams expelled by the collision of the galaxies. The long upper (Southern) stream seems to actually be a loop and a very faint portion of the material appears falling back towards the galaxies. Along this stream several brighter blue knots can be found, culminating in the large extended clump at its end. These knots are composed of young hot blue stars, likely triggered by the violent forces induced by the collision. The shorter lower (Northern) stream extends into a large faint fan shape with a little curl up towards the right. Behind the lower fan of speeding intergalactic stars lies a very rich and distant galaxy cluster whose members are visible as innumerable faint fuzzy spots in the area immediately at the end of the lower stream. This densely populated area extends further towards the left below the colliding galaxies. These background galaxies are so distant that their light is visibly reddened because of the cosmological redshift. In fact, the entire background is littered with such distant background galaxies, and many of these can be seen through the two tidal streams and also through the extended shells and halos of the colliding galaxies. Judged by their colour and apparent size the faintest of these remote galaxy clusters lie several billion light years away. The main action is happening in the centre where intense starburst activity has been triggered by the merging of the two galaxies. Bright blue arcs of hot young O and B type stars light up the core area, together with the distinct magenta hue from massive glowing hydrogen nebulae. The two galaxy nuclei can still be seen separately, with nebulae, star streams and dark dust bands circling around them in a chaotic dance. Based on computer simulations and observations of other colliding systems it is believed that around 1.2 billion years ago these galaxies were two independent spiral systems similar to our Milky Way. Over the following billion years or so the galaxies passed close to, and through, each other resulting in the long tidal tails being flung from the centre. During such a collision multiple shells and streams of material are expelled and our current view provides a snapshot in time of this entire spectacle. The two nuclei are now in the process of falling back towards each other again and the whole system will eventually merge to form one giant elliptical galaxy some time in the distant future. Our Milky Way galaxy will likely share this fate in the future when it collides with the Andromeda Galaxy. Although the large Andromeda Galaxy is approaching our own galaxy with the colossal speed of 110 km/s the two galaxies will not begin to merge for another 4 billion years. Comparison of details with ESO (VLT) and Hubble Space Telescope images. Comparison with deep image from UK Schmidt plates (AAO). Gallery of distant background galaxies. Black and white version, brightened to show the faintest outer extensions. Not so much raising the bar as chucking it completely out of reach :) :) Great work!! Overwhelmed by your patience and expertise and the glorious final result. Extraordinary. Thanks for sharing this work.